Citizens! Here’s some information for those of you who enjoy my musings on Star Citizens’ crowdfunding. So, there hasn’t really been much to talk about in terms of Star Citizen crowdfunding in the past couple months. Things have been quite slow other than the Genesis Starliner sale (click here to check out my analysis of that concept sale), with the average daily intake being roughly $25,000 in the period of June 4th to August 6th (excluding the Starliner sale). For the period of January 1st through May 30th, days of what I call “normal” funding (where there’s nothing special happening like a ship sale) averaged roughly $47,000/day. You can see from the above that the average “normal” daily funding of Star Citizen had fallen off sharply. It’s not exactly surprising. Technical issues with the Star Marine FPS module caused its release to slide hard from what was originally thought to be late March, to now a rough projection of late September. This became an issue for CIG. With Chris Roberts’ stabilizing presence lost as he was in the UK directing Squadron 42’s performance capture shoot at The Imaginarium for 3.5 months, nothing significant to release in terms of new gameplay, and for quite some time also being unable to update Arena Commander… you could feel and see backer confidence slump. That all ended yesterday. Emphatically. CIG’s demonstration of Star Citizens’ Social, FPS, and Arena Commander Multicrew modules proved that a massive amount of work had been done on the core game mechanics and things are coming along quite nicely. The backers responded in kind. Yesterday there was a Gamecom Flash Sale that included the Retaliator, Carrack, Caterpillar, Orion, Reclaimer, Xi’An Scout, and Banu Merchantman. In addition, there was (and continues to be for the next week) a neat “Build Your Retaliator” event where you can buy a bare LTI Retaliator (nothing in the fore and aft bays) for $150 USD and add various modules that fit into the aforementioned bays, for anywhere between $25 and $75 each. These two events plus a fresh helping of backer confidence have combined to generate $817,379 in crowdfunding in the 32 hours following the start of the Gamescom Flash Sale. Despite the Flash Sale being over, Star Citizen is still bringing in between $10,000 and $20,000 per hour at the time of this articles’ publishing. The above graph demonstrates the massive increase in crowdfunding due to the Gamescom event and associated sales. Thanks to /u/SmashedBug for the image! I mentioned above that one of the factors I believe was depressing backer confidence was that Chris Roberts was not often or regularly seen by backers for 3.5 months while he was in the UK working on Squadron 42. Interestingly there is actually some evidence that his presence helps crowdfunding. “Normal” days of funding between June 4th and July 19th averaged $23,773 and in that period 47% of the days of “normal” funding were under $20,000. 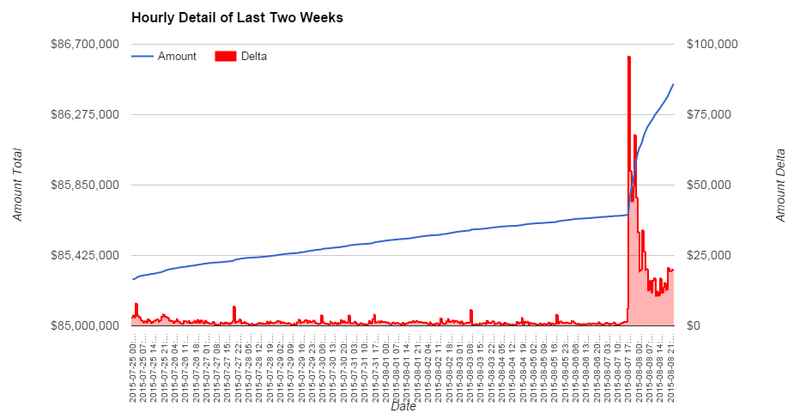 Since Chris Roberts truly returned to the forefront of Star Citizen backer interaction with his Letter from the Chairman and special “Ben for the Chairman”, average daily funding on “normal” days has increased by 20.8% to $28,729. Only 1 of those days has been below $20,000 in funding (or 5.6%). Obviously there are many factors that play in to how much income SC has on any given day, but it was a trend I noticed and I thought it would be worth mentioning. It’s no secret that Star Citizen’s funding momentum hit the skids in June and July. June brought in $1.061 million and July was $0.917 million. July was the first month since May 2013 ($0.740 million) that Star Citizen failed to hit at least $1 million in funding. The causes for this are obvious and outlined above. While this is obviously bad news for CIG, it’s also pretty amazing that CIG maintained crowdfunding in excess of $1 million per month for 25 straight months. The good news is that with the massive success of the Gamescom event and its associated sales, Star Citizen has already taken in $0.978 million in August and will eclipse the $1.0 million mark later this evening. Looking forward, Star Citizen has many opportunities for increased crowdfunding including the MISC Endeavor Research Platform concept sale (probably this month), the Anvil Aerospace Crucible repair ship AKA “flying toolbox” concept sale (probably next month), a slew of other sales (hangar-ready, free-fly, modularity, flyable, etc) and merchandise, and a triplicate of module releases (Social, FPS, AC 2.0). In addition there will undoubtedly be a sale at CitizenCon in October and the legendary Anniversary Sale in November. I still believe that Star Citizen will easily eclipse $100 million by the end of the year. If you just go by how much was made in the period of August 9th to December 31st, 2014 then SC would finish this year at roughly $105 million. I personally think it’s likely to be higher, especially if CIG can get the three upcoming modules out the door by the end of the year. I will personally predict $110 million. If the unlikely happens and Squadron 42 and the PU alpha find their way to release before the end of the year, all bets are off.